I am so very excited about this interview! I had first heard about Nyrae on twitter. 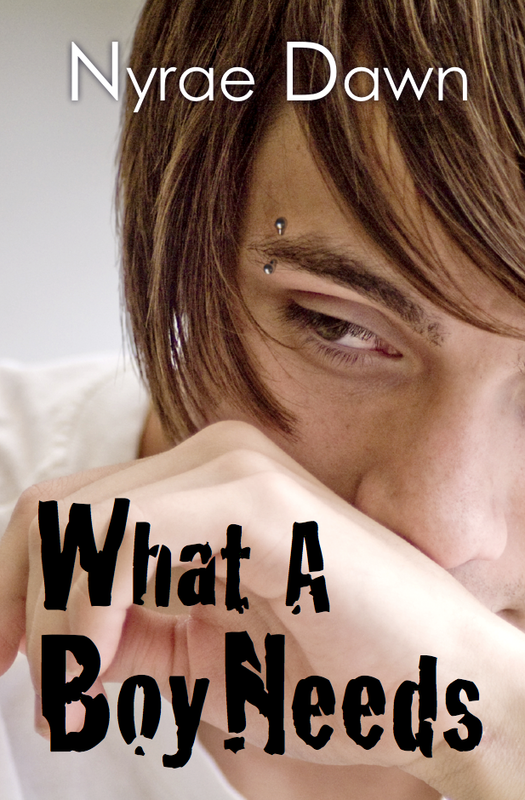 There was a buzz about this new book, What a Boy Wants, and the cover was guy was....hot. I couldn't get the Christina Aguilerra song out of my head so I decided to buy the book. I read it in one sitting and I wanted more. I was even more surprised to find out it was self published! My previous thoughts had been duped. Let's welcome author Nyrae Dawn to The Sweet Bookshelf! 1. What made you decide to go the self publishing route? Being completely honest, I didn’t start out planning to self-publish. I wrote a book, queried, got rejected. Wrote a second book, queried, got a lot more requests, a couple close calls, but still no agent. Wrote a third book, which was Sebastian’s story, queried a ton, got an agent who believed in my talent, but told me it would be a tough sell. Agent and the other agents who rejected Sebastian were right and it didn’t sell. So, I wrote another book, my agent put it on submission, it got rejected as well. Then I wrote another book, LOL. This one didn’t go on submission, but agent and I parted ways. I still had Sebastian sitting on my computer. I loved him so much that I wanted to see if there were people out there who would love him the way I do. So, I decided to give it a shot and it’s been an INCREDIBLE journey. This experience means so much to me and I realize everything happens for a reason. I think this is what was supposed to happen. 2. Do you think you will continue to publish your works this way? Or are you still trying for traditional publishing? I plan to do both. I truly don’t believe it has to be one or the other. I LOVE self-publishing. I love the freedom of it. There are so many fabulous self-published authors out there and I think self-published books have so much to bring to the table. But like I said, I’d like to do both. I would love the experience of both traditional publishing along with self-publishing. 3. What made you decide to write though the male POV? I love the idea of being inside a guy’s head. Love the thought of seeing how they think and how it sometimes differs from women. I had a lot of male friends growing up. I was one of the gang and they felt comfortable being themselves around me. I heard and saw a lot! LOL. I love exploring that. 4. Your reader's are falling in love with Sebastian (What a Boy Wants) and Jaden (What a Boy Needs). What do you think it is about them that people are identifying with? I honestly don’t know, but I am so very grateful for it. All I can say is I tried to be authentic as I could, from my experience with my male friends. I tried to write Sebastian and Jaden like the boys I knew. Did they like girls? Yep. Where they always in competition and talking crap to each other? You bet’cha. But they were also loyal and protective. When I needed them, I always knew I could count on them. That’s what I wanted for these boys. They’re not perfect (who is). But they’re real, and no matter what, they’re GOOD guys, IMO. 5. Jaden's story is much deeper and quite sad in parts. Was it hard to write? I don’t think hard is the right word for it. It was definitely different for me. Jaden’s story broke my heart, but like Sebastian, he’s always been very real to me. His voice was always there as was his story. I always knew he thought differently than Sebastian. That what he showed on the outside was different than what he felt on the inside. I loved his growth and seeing him learn to let his friends in on what was going inside of him. EVERYTHING. I seriously love it. I’m a character person though. I put a lot of thought into who my people are and it’s an incredible feeling to tell their stories. I feel honored to do it. It’s all about the journey for me. I love getting my characters from point “A” to point “B". Twenty Boy Summer by Sarah Ockler, The Summer Series by Jenny Han, Where She Went by Gayle Foreman, Split by Swati Avasthi, Freefall by Mindi Scott, I know It’s Over by CK Kelly Martin, Outlander by Diana Gabaladon (to name a few). 8. Do you have any other future projects you can tell us about? I have another manuscript I’m editing that I plan to self-publish soon. It’s another boy POV book. I’m also working on a revision with my friend Jolene Perry. It’s a collaboration, alternating chapters. She writes the female MC and I write the male. Thanks for stopping by Nyrae! We want you here any time! 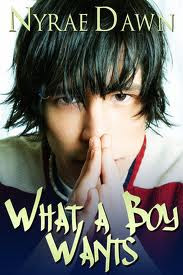 What A Boy Wants was such a fantastic read! Nyrae really has something to be proud of, especially with how hard she worked to get her writing out there! I seriously cannot wait to begin reading What A Boy Needs! This made me interested. I'd like to read it. Could you please send me her email? I would like talke with her about the rights, but she doesn't has an agent.